3 0 User must enter a digit (0 to 9). 9 User can enter a digit (0 to 9). # User can enter a digit, space, plus or minus sign. If skipped, Access enters a blank space. 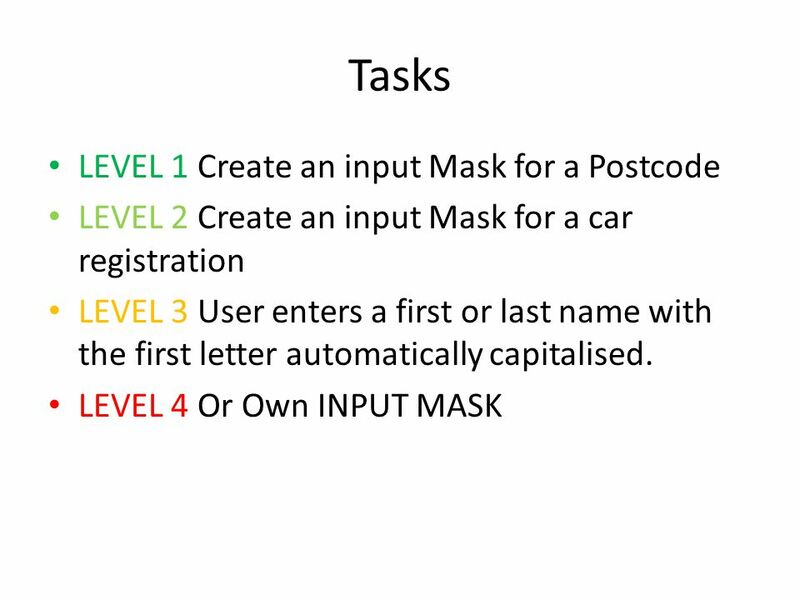 L User must enter a letter. ? User can enter a letter. A User must enter a letter or a digit. a User can enter a letter or a digit. & User must enter either a character or a space. 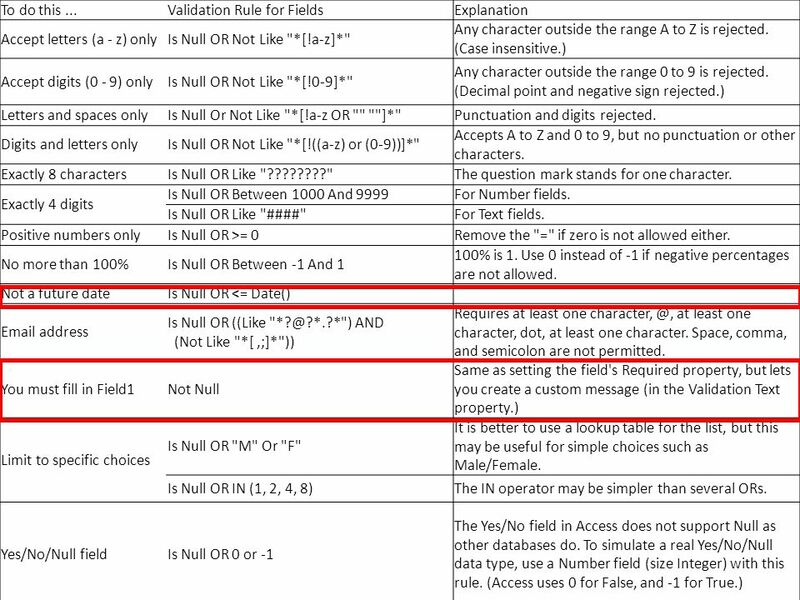 C User can enter characters or spaces. The character you select depends on your Microsoft Windows regional settings. > Coverts all characters that follow to uppercase. 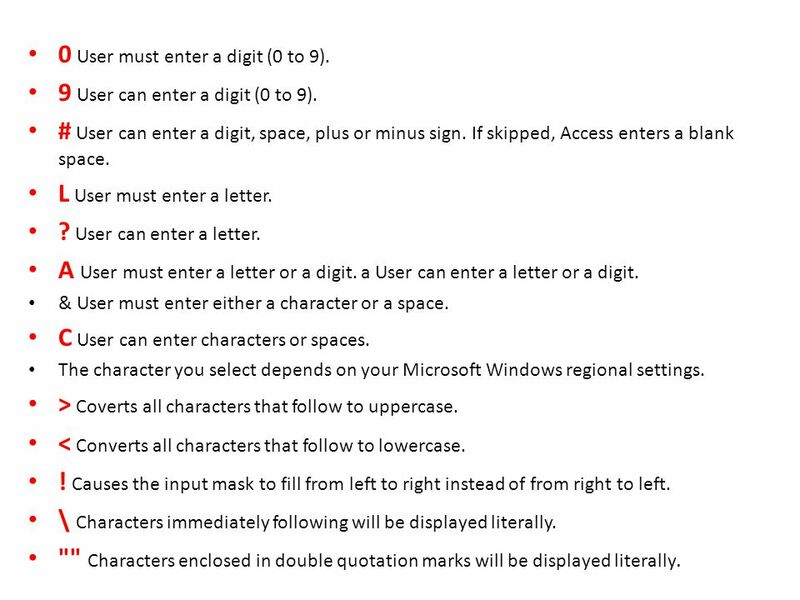 < Converts all characters that follow to lowercase. ! Causes the input mask to fill from left to right instead of from right to left. \ Characters immediately following will be displayed literally. "" Characters enclosed in double quotation marks will be displayed literally. 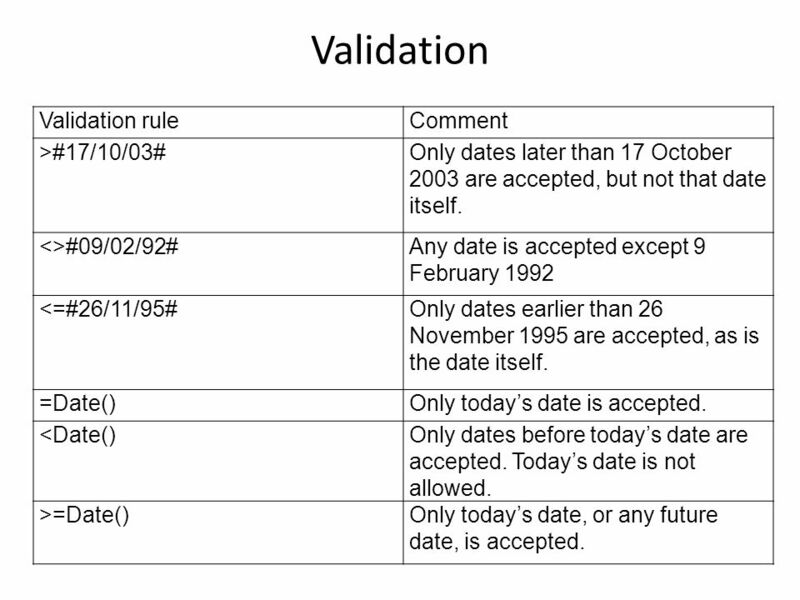 9 Validation Validation ruleComment >#17/10/03#Only dates later than 17 October 2003 are accepted, but not that date itself. <>#09/02/92#Any date is accepted except 9 February 1992 <=#26/11/95#Only dates earlier than 26 November 1995 are accepted, as is the date itself. =Date()Only today’s date is accepted. <Date()Only dates before today’s date are accepted. Today’s date is not allowed. >=Date()Only today’s date, or any future date, is accepted. 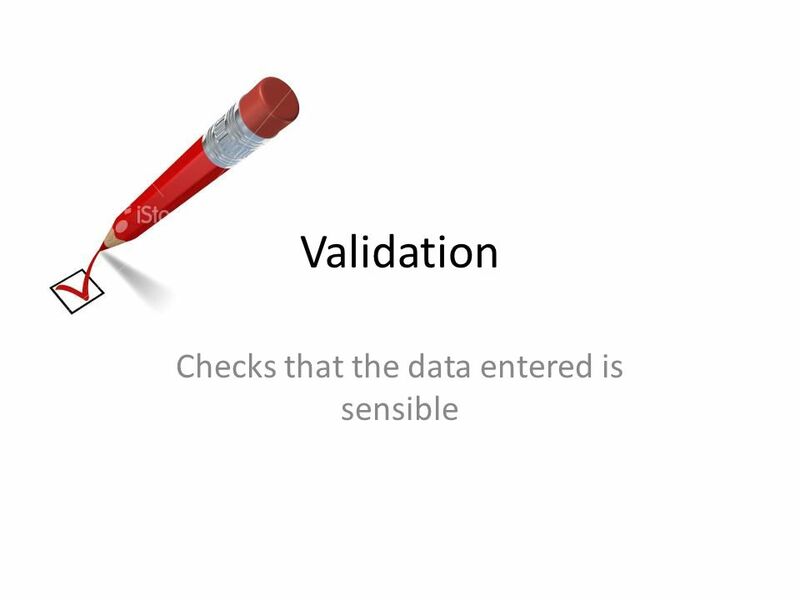 Download ppt "Validation Checks that the data entered is sensible." Copyright © 2012 Pearson Education, Inc. Chapter 4: Making Decisions. With Microsoft Access 2010 © 2011 Pearson Education, Inc. Publishing as Prentice Hall1 PowerPoint Presentation to Accompany GO! 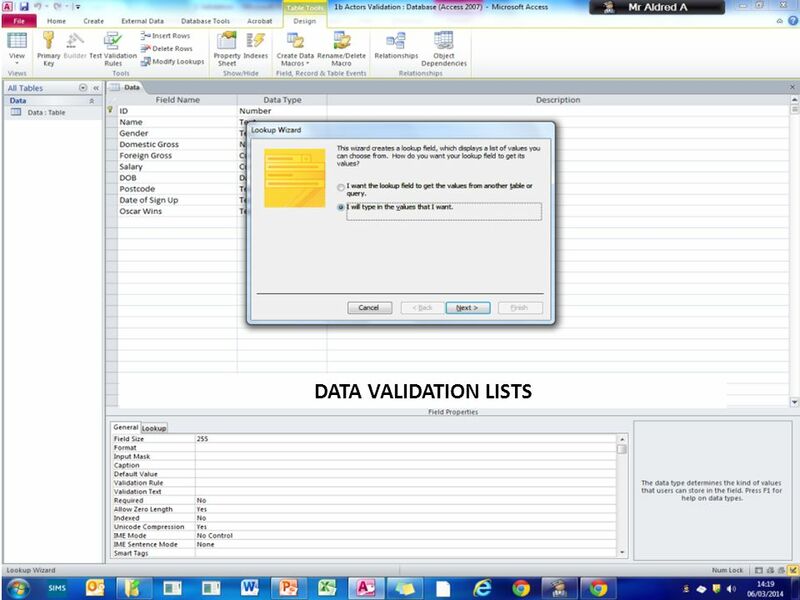 with Microsoft ® Access. Chapter 7. 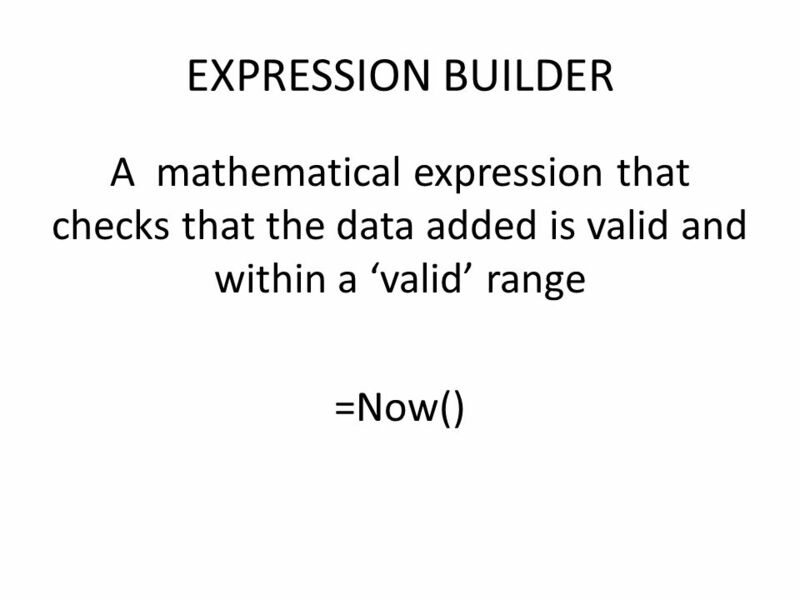 2 Objectives You should be able to describe: The string Class Character Manipulation Methods Exception Handling Input Data Validation Namespaces. 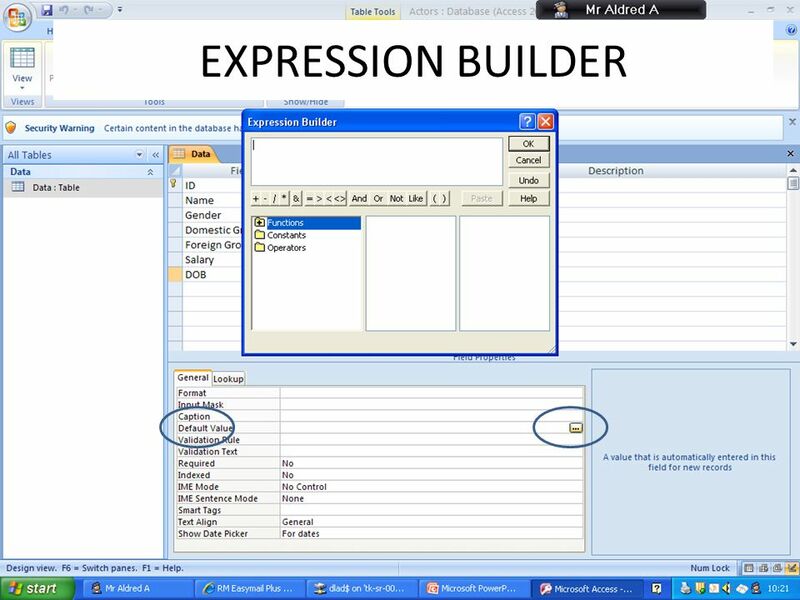 Entering Data in Excel. 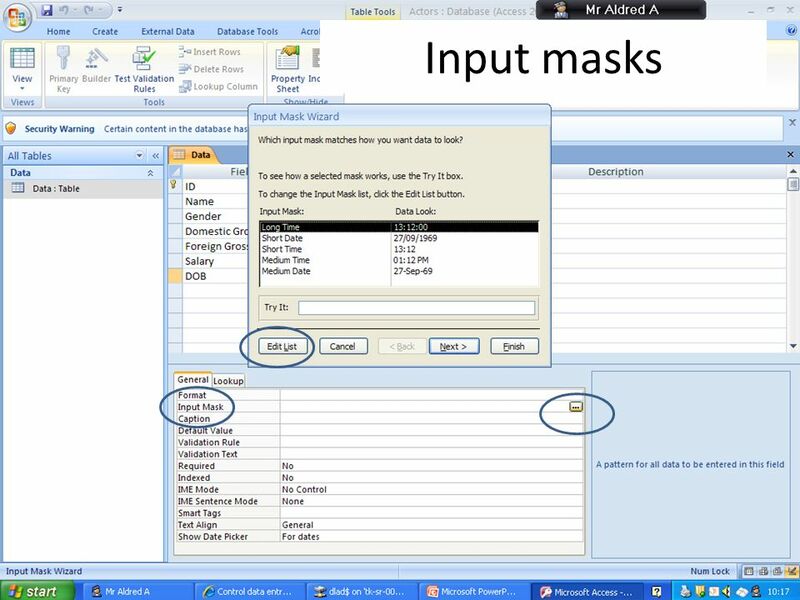 Entering numbers, text, a date, or a time n 1Click the cell where you want to enter data. 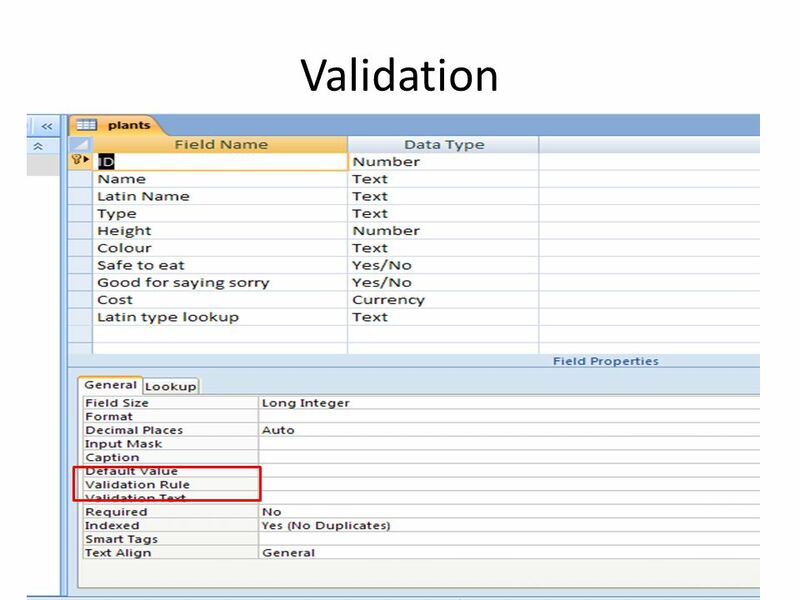 n 2Type the data and press ENTER or. 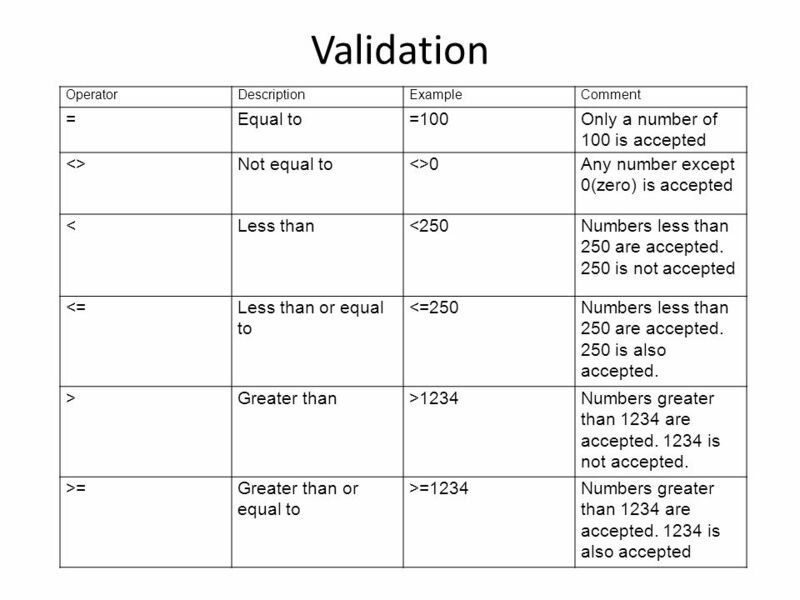 IWBAT compare and order positive and negative numbers.  2007 Pearson Education, Inc. All rights reserved C Formatted Input/Output. 1 Chapter Two Using Data. 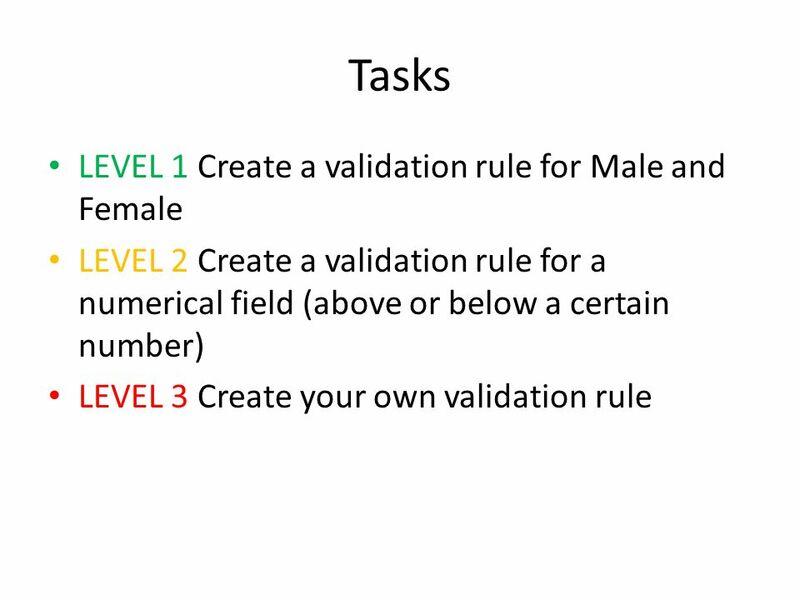 2 Objectives Learn about variable types and how to declare variables Learn how to display variable values Learn about the integral. © Copyright 1992–2004 by Deitel & Associates, Inc. and Pearson Education Inc. All Rights Reserved Streams Streams –Sequences of characters organized.